The goal of the Montessori cultural curriculum is to help the child develop his own personality, adapt to his own culture, and become an independent, useful member of his society. Montessori cultural materials provide individual activities, which help the child to acquire knowledge in the areas of cultural, biology (botany and zoology), geography, history, science and art. Cultural study begins with looking at the universe and solar system and then zooms in to the earth, continents, countries, land and water formations, and continues right down to the people and their habitats. Montessori had a vision that through the understanding and respect of cultures around the world, it was possible to begin the task of creating world peace. 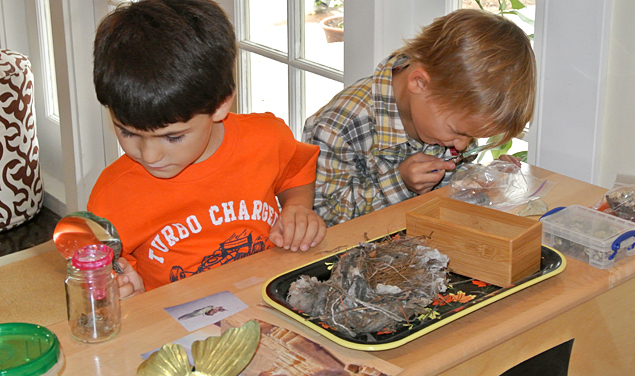 The Montessori classroom offers numerous opportunities for young children to expand their cultural knowledge while they are still motivated by spontaneous interest. 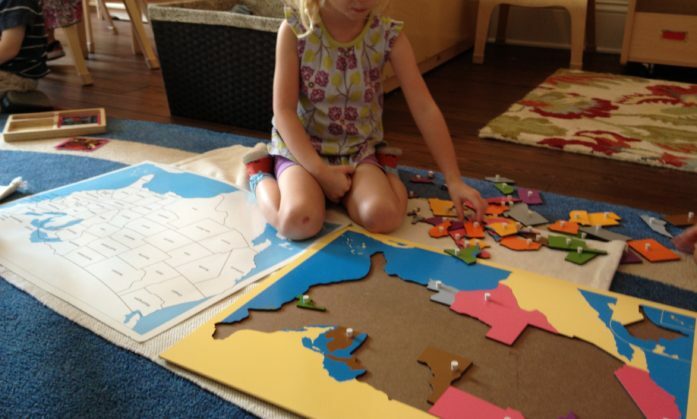 Montessori classrooms have beautiful wooden puzzles of the world and the continents and sets of nature and animal cards that illustrate in color the parts of a tree, the shapes of leaves, the parts of a flower, as well as the parts of various classes of animals. 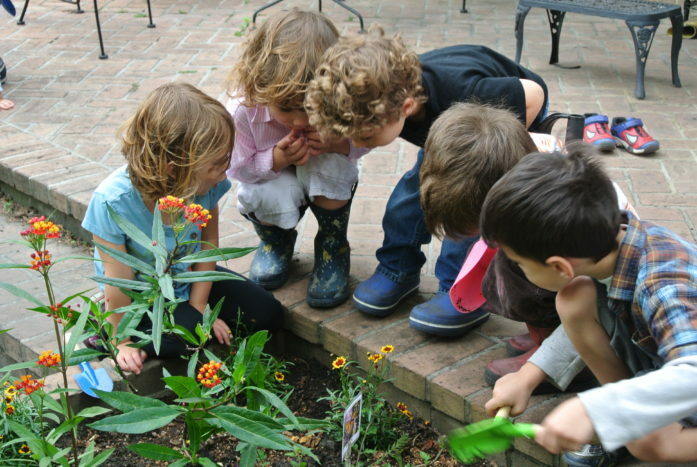 Working with the cards and puzzles enables the children to become more observant of the characteristics of things that grow in their own environment. Many science materials are created by the teachers and reflect the interests of the children and the level of work for which the children are ready. The art curriculum in the three-six classroom focuses on individual art work that is connected to other subjects, which makes it more creative, noncompetitive, and successful than group projects or models create by the teacher for children to imitate. Children in Montessori classrooms do not produce products that all look alike. Just like other activities in the classroom, each art activity is kept complete and ready to use. 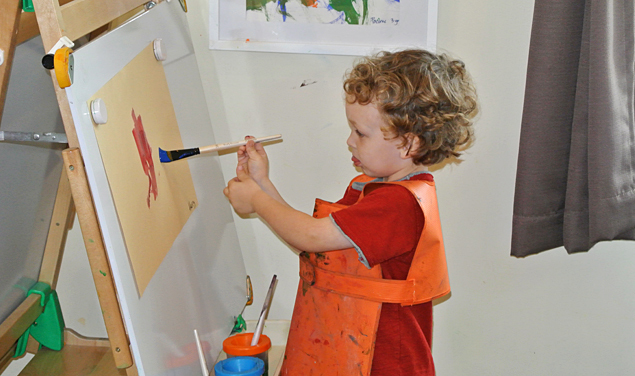 For example, if a child is interested in easel painting, s/he will find an apron, paper, paints, and brushes as well as a bucket and sponge for cleaning up. Brain researchers are discovering how the fine arts help the brain: the brain is using multiple areas to think and problem solve. 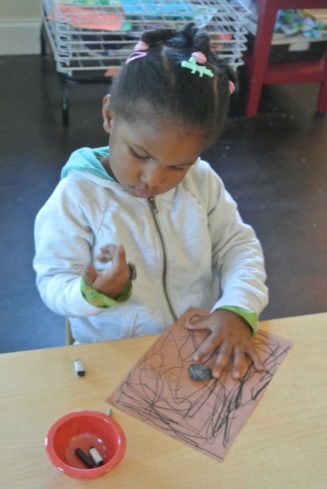 Art engages the areas of the brain where children develop emotion, cognition, and memory. Art activities teach children how to think outside the box. Children begin to absorb the sounds of their native language from the day they are born. In-born activity is maximized during the sensitive period for language. From 1 ½ – 3 years, the child experiences a language explosion and builds a foundation for future language learning. 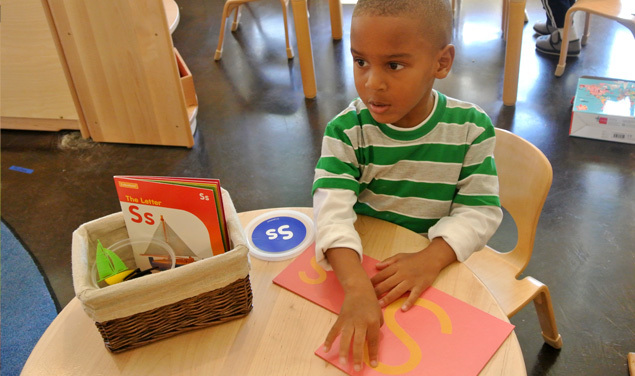 The sensitive period for reading and writing occurs from ages 3 – 6. In the Montessori classroom the children are exposed to many kinds of reading from the three-part cards to sequencing and classifying. 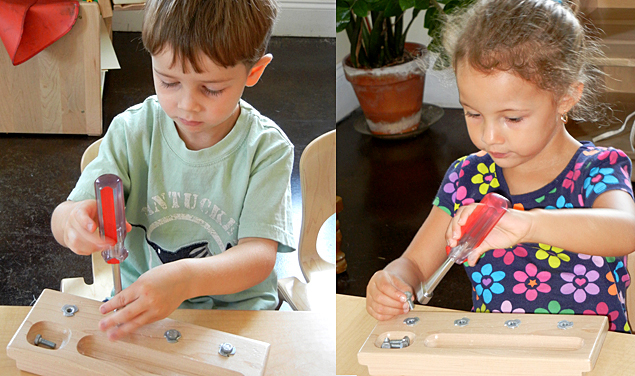 Maria Montessori designed the metal insets, the movable alphabet, and the sandpaper letters. These foundational materials have been copied and used by many in the teaching of reading and writing. 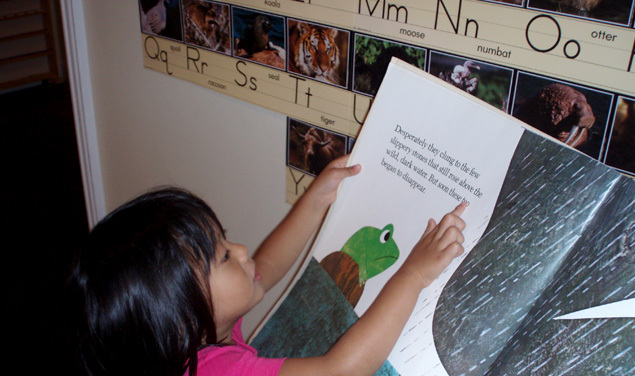 Cathedral Montessori School has a library that is separate from the other areas of the school. All of the children have library time for 30 minutes each day. The library has close to 2,000 books in all genres, including a large nonfiction collection. The books are rotated in and out of the library so that the children’s interest always remains high. Library time starts with a read aloud where the children are engaged in a literature discussion focused on building listening, vocabulary, and comprehension skills. 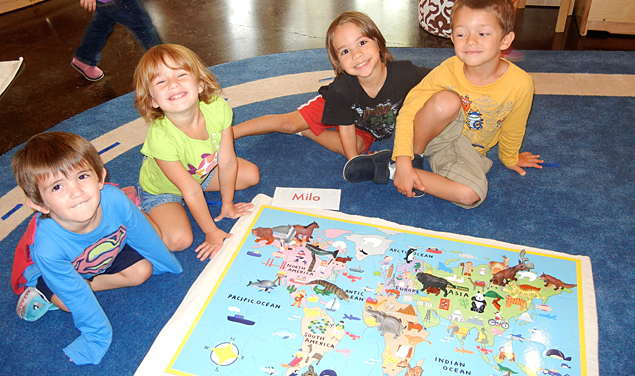 The Montessori language curriculum aligns with the results of the 2000 report of the National Reading Panel. The report emphasizes the five areas critical to reading success: phonemic awareness, vocabulary, comprehension, and fluency. 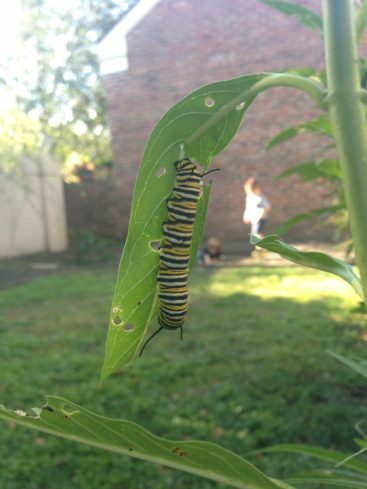 These five areas occur naturally in all five areas of the Montessori curriculum. 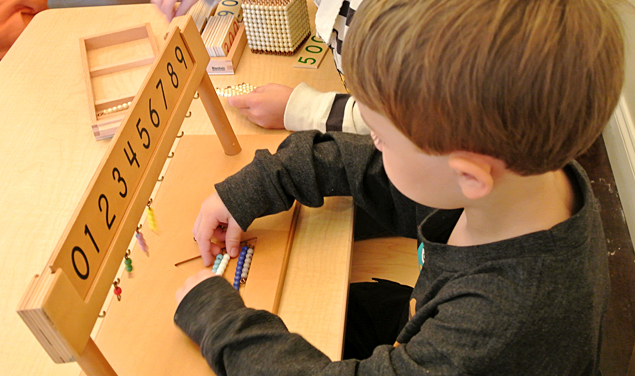 Montessori believed that we are born with mathematical minds, and that we have the propensity to learn things that increase our ability to be exact and orderly, to observe, compare and classify. She believed that mathematics needed to be part of a young child’s experience so that this vital part of intelligence would be given help and direction for it to develop and so that the subconscious mind would be willing to accept mathematics at a later date. The indirect purposes of the math materials are an example of exposure to concepts that will lay the foundation for increasingly complex math operations. 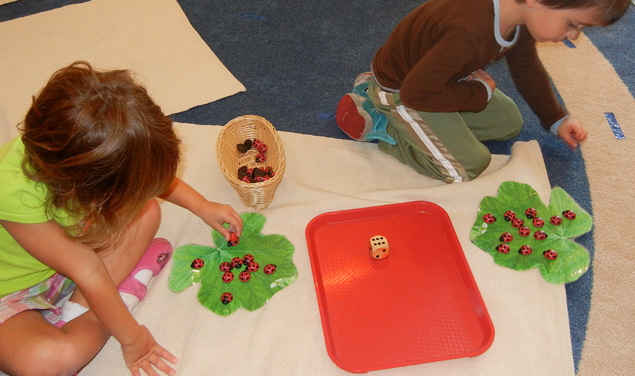 The Montessori sensorial materials lay important groundwork for the development of a child’s mathematical mind. The Sensorial Material is mathematical in nature. 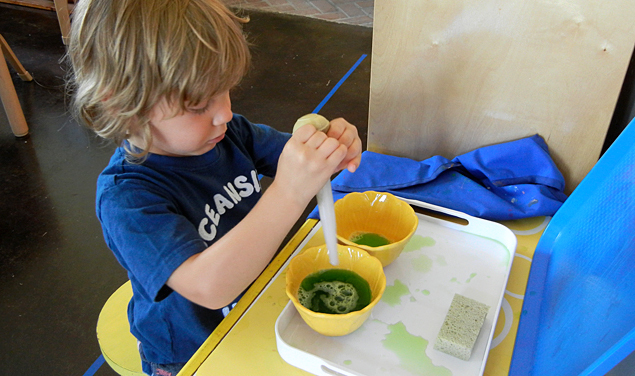 The sensorial activities call for precision and allow the child to come into contact with isolated concepts. 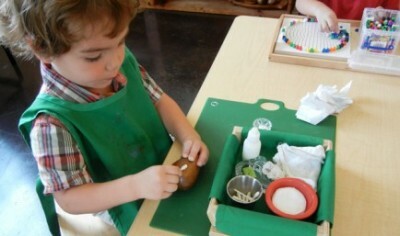 The sensorial work prepares the child for the study of sequence and progression. These concepts also help the child order his mind, and the repetition of the isolated concepts pave the way for clear abstraction. 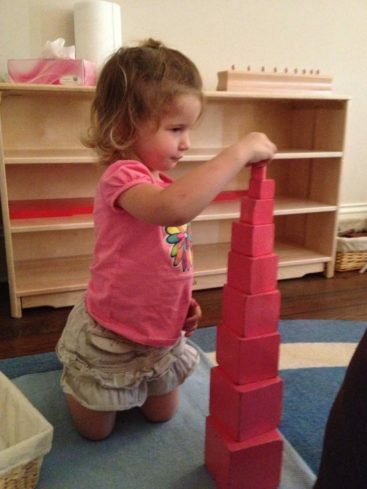 As with all Montessori materials, the math materials are aesthetically pleasing and are presented and arranged on the shelves in the order of increasing difficulty. The materials are presented sequentially and isolate one concept at a time. Exploration of the math materials begins with presenting concrete impressions of abstract concepts, which are paired with movement and the use of the child’s muscular memory. 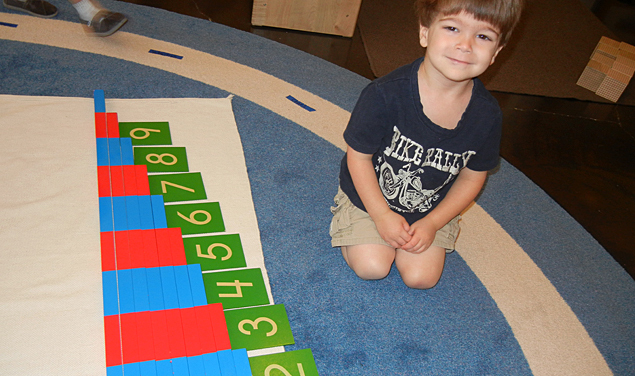 The Montessori math materials are real, three-dimensional, multi-sensory objects instead of flat pictures in a workbook; they stimulate the learning process and enhance recall through memory. Every material provides a rich learning experience for the child. The education of the senses aids the natural development of the child, which is an important tenet of Maria Montessori’s philosophy. 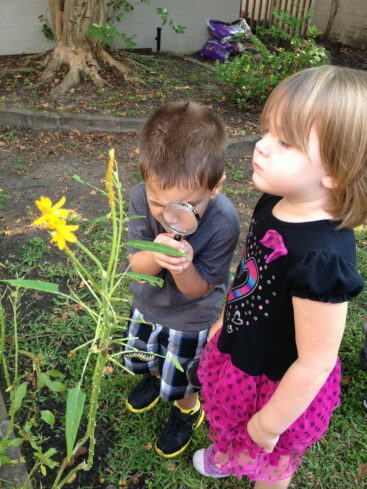 Children naturally use their powers of observation during their early years; therefore, Dr. Montessori felt that this was the ideal time to provide experiences and materials that would sharpen the senses and enable the child to understand the many impressions they receive through their five senses. The orderly manner in which the education of the senses occurs has a direct impact on neurological and psychological development. As refinement of the senses occurs, the child develops cognitive skills such as thinking, problem solving, association—all of which are an indirect preparation for intellectual life. Through the isolation of the senses, the child is able to develop a refinement of each of the five senses—tactile, auditory, visual, smell, and taste. 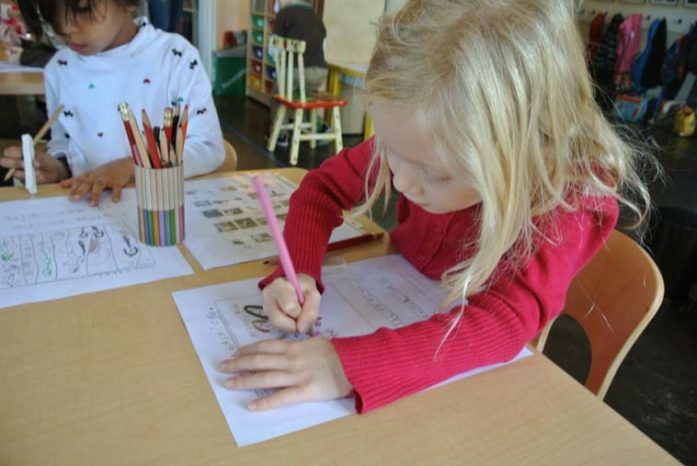 Opportunities for language development are also provided, such as left to right eye movements, visual and auditory discrimination, eye hand coordination, vocabulary development, and strengthening of the fine motor skills needed for future writing. The development of the mathematical mind and the preparation for language development are indirect goals of the sensorial materials. Through freedom of choice and purposeful activity, the children’s work with Practical Life activities helps them develop balance, coordination in movement and manual dexterity. The exercises are based in reality and are necessary for the child to develop the skills needed to become a functioning member of society. Practical Life exercises emphasize the three-finger group, left to right movements, and top to bottom movements. These are important prerequisites for the development of reading and writing skills.